The stinger is a great cocktail. It's versatile. It really makes a great nightcap or you could enjoy a cold stinger on a hot summer day. I think the key to a good stinger is that it should be cold. I wanted to tweak the stinger a little bit though. I wanted to see what I could do to replace the creme de menthe. I like my stinger dry and minty, and you have to be very careful with the creme de menthe, or your stinger can fall into the realm of cloying and sticky sweet. I wanted to kick up the mint with a more natural flavor so I made an intense minty simple syrup to replace the sweet liqueur. Heat up the water and mix in the sugar to make a basic syrup. Pack a large mason jar with mint and cover with the syrup and vodka. Refrigerate over night, then strain into a clean conainer. Shake over ice and serve over crushed ice, garnish with fresh mint. This modified stinger turned out really well. It's really dry and crisp, and the mint tastes like real mint, not mint candy. It makes a nice foil to the brandy and tastes very balanced. I'm looking forward to trying my mint syrup in some mojitos and some mint juleps. I'm sure I'll get lots of ideas from this weeks other Mixology Monday posts. 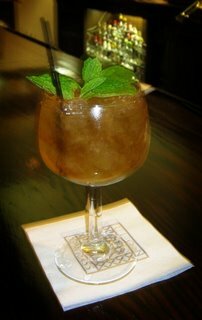 Be sure to check out the Mixology Monday Wrap-up over at Kaiser Penguin for more minty freshness. I've got to try that mint syrup -- I've been looking for some better alternative to creme de menthe (here in Washington, the only brand widely available is DeKuyper, which is just so damn disappointing). How did the appearance come out -- I tried a mint infusion a few years ago and it came out kind of black and unappetizing, though I think I let it soak for much longer than 24 hours. Also, have you tried your syrup in a bourbon stinger (aka Dixie Stinger, though it kind of sounds like a stripper)? I prefer them to the standard brandy variety, especially when made with a soft wheated bourbon like Maker's Mark or Weller 12 year old. The color of the syrup is kind of golden yellow. Think of the color of Dewar's and that's about where it fits in the spectrum. Not bad, but it's not clear either. I think mint does go black as it oxidizes, maybe the vodka is acting as a preservative? I haven't tried it with anything else yet. I'm wondering about a minty Negroni (which may be toooo much) and something along the lines you mention, with some nice Single Barrel Rye I have here.